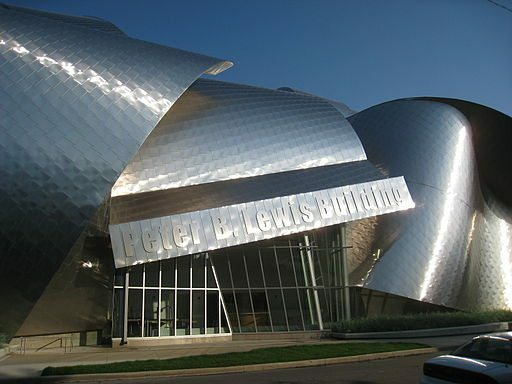 In 2002, Peter Lewis caused a scandalized frisson among philanthropists when he swore to cease his generous funding of Cleveland-based nonprofit groups, including Case Western Reserve University, which he charged with mismanagement related to cost overruns on a Frank Gehry-designed building he had funded for the Weatherhead School of Management. (Gehry has worked with Lewis on a number of projects and calls Lewis something of a patron.) The building now stands as a conversation piece among those who love it and those that…don’t so much care for it, but many say that the impact of the design has been muted by the building’s awkward siting, which was part of the dispute. Although some viewed Lewis as irascible, there was also a fair bit of evidence that he had a point. The Cleveland Plain Dealer writes, “During the six years in which the building was planned and built, the university changed presidents four times and the Weatherhead School changed deans four times. It could seem as though no one was really in charge of the project.” The school also stonewalled Lewis when he asked to speak to trustees. But Sunday, Lewis changed his stance, urging graduates to “love and support Case Western Reserve University.” He also talked some about his advocacy of the legalization of marijuana, efforts toward which have borne proud fruit in Colorado and Washington State, where the drug has been okayed for recreational use. An additional 18 states have approved the slightly-less-exciting medical access. “We are making progress,” he said.